So as many of you may know (though few of you may care), I get obsessed with ultralight travel gear, particularly when it comes to stylish travel clothing that’ll work just as well on the trail as it will in my doomed efforts to impress my peers in the midst of social situations. Try as I might, I’m still looking. One particular area that’s always been challenging has been travel pants. You’d think this would be pretty simple, since pants have been around for thousands of years and haven’t changed a whole lot in the last century, but the chasm between casual clothing manufacturers and performance apparel companies leaves no part of the Venn diagram with any overlap. With bizarrely few exceptions, travel pants are oddly challenging to find. Because I’m right, you low-standards bastards. Part of the problem is that no outdoor clothing company seems to make travel pants. They make hiking pants. And they’re totally unsuitable for travel. They don’t seem to realize that when it comes to travel, form is function. You know what the ladies’ll love? A fully elastic waistband, integrated nylon belt, zip-off legs, and lots of Velcro cargo pockets. They’ll be fighting over you in no time! For many backpackers, travel includes a wide variety of activities, from outdoor hikes to pub crawls. Most people pack a couple outfits for wilderness experiences, and a few outfits for stylish occasions, meaning each outfit will handle only half the challenges. But why can’t they do both? All you need for high-tech performance clothing is the right fabric. And all you need for decent style is not screwing things up. It’s actually quite simple. And if they can handle both, you can carry half as much gear, which is how I was able to go for 9 months with a 20 liter daypack. Yet many outdoor clothing companies seem to regard fashion with disdain, dismissing the need for stylish apparel, thinking it’s useless up on the mountainside. So they stick extra zippers all over the place, embroider the garment with half a dozen logos, and maybe add some reflective trim and racing stripes for good measure. And then those items become completely useless when your buddies invite you to a wedding or whatever. If you don’t want to look silly, you have to pack extra clothing. Beauty is actually a performance advantage. Performance fabric. I look for quick-drying, wrinkle-resistant, breathable fabric that also feels more or less normal, so I’m not yearning for a decent pair of jeans. If possible, no cotton. A few natural fabrics might work nicely (hemp or Tencel maybe), but they’re so stupidly rare that nylon and polyester are pretty much all that’ll work right now. Stretch fabrics can be useful, particularly for slimmer cuts. Casual styling. No visible zippers, no logos, no zip off legs, and no built-in belt. Cargo pockets can be fine, as long as they don’t look weird, though I think it’s good to have at least one pair of pants without them. And it’s not like zip-off cargo hiking pants aren’t useful, but at the very least I also want something that looks like a regular pair of khakis or jeans. Hidden security pockets. Emphasis on hidden. I think two is probably enough; one zippered back pocket for a wallet, and one zippered hand pocket for a camera and maybe a passport. This allows you to skip the money belt, which makes things more comfy. I prefer jeans-style pockets, so nothing falls out when I sit down, but they’re oddly rare. For some reason this trio is oddly difficult to find in a single pair of pants. Plenty will hit two out of three, but in school, that’s a D, and that’s just one step away from an F. Get it together, guys. So it’s not all bad. A few companies actually make travel clothing, aka regular clothing with performance fabrics, without sticking silly zippers all over the place. Way to go, guys! Everyone else on the planet is stupid! So I’ve rounded up the best examples of men’s travel pants out there, which at this point (updated early 2018!) are absolutely stellar. This is likely to be the best all-around category for most people. Classic khaki styling, with hidden zippered pockets inside the main zippers to keep things safe while looking classy, with a performance fabric that’ll dry quickly, last a long time, and pack down small. Bluffworks Chinos, a do-it-all performance travel pant. Bluffworks was started by a guy who got sick of having to iron his fancy office pants all the time. Knowing there was a better way because he had used travel clothing before, he made his own pair of office-appropriate performance khakis that didn’t need any babysitting, and started his own company. Ironically, this means he no longer needs any low-maintenance office clothing, which was the whole point in the first place. But oh well. Besides, now I can have some! They’re durable, wrinkle-free, quick-drying, lightweight, high-performance pants, and they look normal, making them one of my top recommendations for performance pants with casual styling. Bluffworks currently have two versions; the original fabric, which is non-stretchy, and the Chinos, which have a softer, stretchier fabric. I’ve been sent test samples of both, and I much prefer the Chinos for those two reasons. The originals are a bit more breathable, due to the thicker yarns, but since they’re both pretty light, it’s hard to overheat. The Chinos do have a bit of a synthetic shine to them, typical of polyester, but it’s not as obvious as others I’ve seen that more closely resemble workout pants. Here’s a review of the originals, and here’s a review of the Chinos. They have the same pockets and overall layout (although the stretchy Chino has slimmer fit options), with a total of 7 pockets, 3 of which are zippered (and hidden), giving them more security features than anything I’ve found. Rohan Fusions, some of the most normal-looking travel pants I’ve found. If you look nowhere else, Rohan will probably outfit each and every one of your needs just fine, particularly when it comes to pants, seemingly all of which have minimal adornment and multiple hidden zippered pockets. While options are numerous, I’m mentioning the Fusions because they’re one of the most normal-looking options they’ve got, but with hidden security pockets and a performance fabric. They’re definitely a lightweight pant (and non-stretchy), meaning they’re similar to what you’d find in a standard hiking pant. The back pockets also have a bit of an unusual sewn-down design, which isn’t exactly typical of ordinary clothing, but it’s subtle enough that it’s nothing crazy. Check out their Grand Tour Chinos as well, though. They have a more classic and upscale appearance, and I went back and forth as to which one to include here. Sizing is a little tight though, especially by American standards, so it’s better to size up in the waist. They’ve got a US site, separate from their hometown UK site. Update: They recently sent me pair of their Jeans Plus, which are travel-friendly jeans with hidden security pockets and performance features, while still looking just like regular jeans. Check out a review here. I originally kept soft shell pants in an entirely separate article, but I’ve decided to include a few options here, as they finally have security pockets! Soft shell pants are a great alternative to standard hiking pant fabrics, as they’re usually double-sided, with a heavier nylon exterior, but a softer polyester interior. They can be thick or thin, but they’re always durable, breathable, quick-drying, and super stretchy––usually flexible enough for yoga, ballet, or whatever else. They generally have a weather-resistant finish, making them extremely versatile for a variety of climate conditions and activities. Take a look at a full list of great soft shell pants, along with a more in-depth description of how “soft shells” look and feel. The Proof Nomad pant, a super-stretch soft shell with security features. Huckberry has resurrected the Proof brand, formerly known as Proof NY, and started things off with a soft shell pant with office-appropriate styling, and a hidden security pocket. It’s also surprisingly affordable, given the usual high cost of most soft shells, and it can even work as office clothing when you come back home. The back pockets and waistband close with snaps, giving the back pockets a bit of additional security as well. What I also like about the hidden zippered pocket (located in one of the front hand pockets) is that it uses an on-seam, so-called “invisible” zipper, so you can’t see it, even if the regular pocket is arching open a little bit. They’re also super stretchy, offering little or no resistance, no matter what you do with them…but the waistband is reinforced, so it doesn’t sag or get stretched out over the course of the day. The fabric is also quite light; usually soft shells are meant for winter use or mountain hikes, but this is better for moderate to warm weather. I also find it easier to use lightweight soft shells in cold weather than a heavyweight soft shell in warm weather. Since the polyester inner lining of a double-weave soft shell tends to retain heat, it’s easier to push it to handle the cold environments than vice versa, meaning a lightweight soft shell can work year-round, whereas a heavy one can’t. Huckberry sent me a test sample, and it’s exactly what I mean when I say “soft shell pants,” and the most affordable option in the soft shell category I have yet seen. I was a little worried about how the snap closure waistband might pop open, but I haven’t run into any trouble with it. The Seagale Active Stretch Chinos. Seagale is all the way over in France, and dealing with international shipping costs (and returns, if necessary) is probably going to be annoying…unless you’re over in Europe, in which case this is going to be a great place to look. They’ve got a full range of travel clothing as well, so definitely keep an eye on them if you’re local. These chinos come in casual colors, look completely normal, and have a security pocket in one of the front hand pockets. I’m also a big fan of that slide button they use, which is a neat little touch. These are what I would describe as the midrange of fabric weight, at 230 grams per square meter, a little more substantial than some of the lightweight options and wispy-thin hiking pants out there, making them a good all-around choice for most seasons outside of the extremities. Because of the inner lining, this weight might be a little too warm in hot weather for people who tend to overheat quickly, however. Year-round use can work, as long as you’re not using them in tropical summers and other hot environments, where you’d want to switch to shorts. Keep in mind they’re using metric sizing, like smart people should. They’ve got a jean-pocket version as well. I am obsessed with jeans. The front pockets are horizontal, making it very difficult for keys, coins, phones, and other precious items to fall out of them. I pretty much wear them exclusively for this reason, especially when I’m traveling. They’re also much harder to pickpocket, and if you throw in another hidden zippered pocket (which both of these options do) then you’ve got a real winner. I’ve drawn up a lengthier list of some great soft shell jeans over here (though most of them don’t have security pockets, which the options listed here do), although if you’re looking for that classic denim blue, check out this list of travel jeans, all of which do have security pockets, although they use a blend of cotton and synthetic materials for the fabric. The Western Rise AT Slim Rivet Pant––kind of my holy grail. So I’m happy to say that these shot right up to the top of my list the moment I tried them on. They’ve got classic jean styling, casual colors, a hidden zippered pocket in the back, and a burly, stretchy fabric that’s as close to a natural-feeling material as anything I’ve found. I picked up a pair on my own, then got an email from Western Rise a week later, and I enjoyed them so much I said I wouldn’t mind a second pair, and they were happy to send one my way. What’s different about this fabric, unlike soft shells, is how the fabric is single-sided, and uses thick yarns instead of finer ones. The single-sided fabric is cooler than double-sided ones, since it doesn’t have an insulating layer of polyester on the inside, while thicker yarns allow for a more natural look and feel, and greater breathability. Despite how these are the heaviest pants on this list, I don’t find myself overheating in them, even when doing something athletic. The breathability and lack of heat-retaining lining really works that well, despite how often I usually overheat. The only downside for me is that the pockets are pretty small, making larger smartphones difficult to use with them, and they’re not super-stretchy like soft shells. Casual use will be just fine, along with light hikes and things like that, whereas crazy yoga stretch and karate kicks work better with a “true” soft shell pant. If you want more details, I’ve got an in-depth review here. You can pick them up from Western Rise, or Huckberry. Update: Make sure to check out the recent Evolution Pant! It’s 2/3 of the weight, and includes the deeper pockets I recommended! Thunderbolt Jeans Lite, a lightweight soft shell for year-round use. These have actually been around for quite some time, but now that they’ve got a lightweight version, they’re great for year-round use. These are a true soft shell pant, using a Swiss fabric that has been the inspiration for all the others, with a double-sided construction, placing tough nylon on the outside, and softer polyester on the inside. These have classic jean styling, and the back right pocket has a zippered closure. They describe the waistband as non-stretch, but the intention is to mean it only stretches a bit, but won’t overstretch and sag, which is a nice combination. The rest of the fabric is super stretchy, great for athletic use. With a lighter fabric than most soft shells (similar to the Proof Nomad pant above), it’s going to be more versatile than their regular version, which is heavy and lined with polyester on the inside, so I’d only use that in deep winters or high mountain hikes. This lightweight version is much more versatile, as soft shells tend to warm up more easily than they cool down, due to the inner lining, meaning it makes more sense for soft shells to be lightweight in order to work year-round. Thunderbolt sent me the shorts version of these as a test sample, and I’m definitely happier with the new lightweight version than the heavy-duty originals. This isn’t quite the type of travel I do, but I wanted to include this category for the people out there busy doing important things. 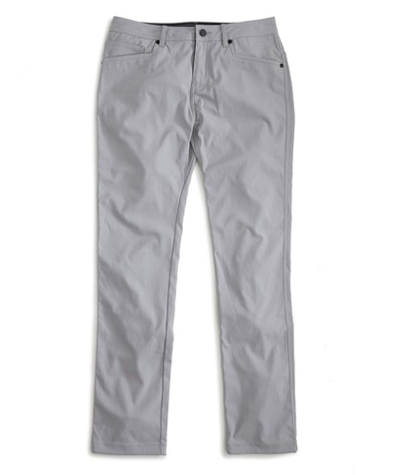 Heathered slacks don’t usually have travel-friendly security features, but these do––and although Bluffworks, Rohan, and companies like Travelsmith have options that would qualify for this category as well, I didn’t want to get too repetitive with multiple entries. These aren’t going to be heavy-duty options for hiking in the mountains, but they’re more travel-friendly and durable than your average dress pants. Makers and Riders wool trousers: The only game in town for travel-worthy merino pants. I’ve been a fan of these ever since I tried them, and now that they’ve revamped the lineup to include a hidden zippered security pocket, they definitely deserve a spot on this list. I’ve been sent a couple test samples, and the more recent versions with that hidden pocket are what have earned these a mention here. These feature a blend of merino, everyone’s favorite travel fabric, along with durable, quick-drying polyester, making them a lot tougher than you’d expect from a wool pant. The addition of spandex makes them more flexible than typical dress pants, and the hidden security pocket in the back right pocket keeps your wallet safe and sound. They’ve got a jean version as well, which I much prefer, but I figured a dressy fabric would go over pretty well in a classic dress pant style. They’ve got a few other options, but the ones labeled 4-Season are going to be much more versatile, especially in hot weather, than their 3-Season products. The fabric on these is like a light dress pant, which is what you’d need with wool to keep cool. I will say that the wool isn’t the softest, so they’re a little scratchy, and they’re not super stretchy, but you’ll probably keep these for casual or business use, not crazy athleticism. This company currently makes only one product: A dress pant in a quick-drying fabric blend, with a zippered security pocket in a front hand pocket. The fabric is a blend of polyester, rayon, and spandex, offering a blend of quick-drying synthetic with softer, more absorbent fibers. This is a fairly common fabric blend used as a wool alternative in suit jackets and pants, making it fairly similar to what you might find in a department store, but I wanted to give it a mention because it actually has that hidden zippered pocket, which is nice for keeping passports or other extras safe and sound. That’s the feature that distinguishes it from those other standard options, as it’s otherwise fairly straightforward. Also, the majority of the fabric is polyester, giving it a quicker drying time than a blend that’s mostly rayon. It has a bit of a swooshy sound as a result, however. I received a test sample of these, and they definitely look great. Again, they’re not radically different in fabric composition from low-cost wool alternatives you can find in a mall, but none of those have a security pocket, and dressy options with hidden zippers are notoriously difficult to find, which is why it’s here. Yes, that appears to be the end. I don’t know why it’s so cartoonishly difficult to find men’s travel pants, but for some reason or another, every outdoor company insists on sticking silly contraptions all over the place that scream “Look, guys! This zippered pocket is where I keep all of my most expensive things!” Argh. I decided not to include “hiking pants,” despite how some of the options out there look pretty decent, because they go in and out of availability all the time, requiring frequent updates; however, you can find some good options from Royal Robbins, Ex Officio, Marmot, REI, and the tiny Railriders that’ll do quite nicely, generally at a more affordable price than the options above. They’re not my favorite––I’ve gotten spoiled with the best-of-the-best––but they’ll certainly do the job. Well, that’s about it for now. I’ve spent so much time digging around that I’m tired of putting the effort into getting into other people’s pants. They should be trying to get into my pants. Besides, we have enough options at this point that you can travel the world in style. And who wouldn’t enjoy that? Thank you for your explicit reply. I will order the jeans + and might give a try to the Brion as well. Just wondering what do you think about packing cubes? Oh and i love your advice. Thanks. Always happy to help. I like packing cubes a lot, but you don’t have to go too crazy with them. They’re good for extra changes of clothes, but I like to leave jackets loose in the pack, so I can grab them easily while I’m walking around, if necessary. Just one usually works out fine, although some people like to use two smaller ones so you dirty clothes go somewhere else. Eagle Creek makes a double-sided cube that works nicely (although it helps to have an additional plastic bag so you can hand it off to laundry staff if necessary). I’m using fjell räven trousers for travelling. They have a wide variety of models with different pockets. I think all of them have a hidden safety pocket. They are made out of poly cotton which dries very fast, is durable and ,very important for me, mosquito proof. I think the models with cargo pockets don’t look to outdoorsy. The downside is that they are quite expensive for my taste. I had a look at the 5.11 apex which should have the same properties stater above. However the cargo pockets have a zipper and are hardly noticeable. Also the retail for less then the fjell räven trousers. I kind of like the old-school outdoorsy look of Fjallraven, but it’s not going to be as light as some of the more modern, high-tech stuff. Still, some of their outdoor gear, made of the cotton/polyester fabric they love so much, can be made very weather-resistant with the wax treatment they provide (which is basically like the DWR finish you have to apply on modern rain jackets, so the upkeep for each isn’t radically different). If you have to do a sink wash, pure synthetic pants are best; but if you have a washing machine and a day to let it air-dry (or a machine dryer), then I think the cotton/poly blends can work just fine, and often blend in a little better, if the style is right. With 5.11 I don’t have too much experience; they’re probably quite durable, but I’ve mostly seen the military styles from them, which might look a little out of place in certain settings, but some of them might be fine. Have you had a chance to try the anatomie pants for men yet? I have a few pairs of their women’s pants and am thinking of getting some for my husband, but I can’t really tell anything about the fit from their typically terrible photos. I can’t really find any. Are you sure they’ve started making them for men? The equivalent will more likely be something known as a soft shell pant. Lululemon has something called the ABC pant, which you can find pretty easily, although I prefer some of the more subdued styles of other brands. They seem to do the sponsored post thing (the only reviews by people who paid for theirs appear on Amazon, basically) so it might be worth reaching out for a review pair. I appreciate your reviews since my husband is not into shopping at all. Good to know. I’m glad to see more companies branching out, although I think it’s been easier for guys to find options like these for the last few years. Enjoyed this post and went with the REI pants, thanks for the recommendation! I also find a list myself a list of travel pants. My hubby is a bit picky on this when it comes to pants. Personally, Bluffworks pants are my favourite because of the simplicity and color. Thank you for your recommendation and please keep it up. I am looking for travel pants that are convertable as well into shorts. You have any suggestions? Ideally they would be tight/narrow around the ankle.. I don’t keep too much track of them, as I try to avoid zip-off pants for style reasons, but there are plenty of options out there from Columbia, Ex Officio, and other brands you’d find at a camping or hiking store. The materials are usually pretty similar, and they’re certainly functional. I had several pair of ‘World Class “Traveler” (Trade mark) Performance’ pants bought years ago. They were microfiber polyester, machine washable, wrinkle free, and made in the USA. They had five pockets. Two hidden security pockets, one zippered left back pocket and a double left hand pocket, one zippered.The back pockets also had buttoned flaps. They were suitable for dress or casual wear.To me they were the perfect business travel pants. Any idea where they might be found today? I haven’t heard of that one, but Bluffworks is about as close as you’re going to get, I would say. Thanks Peter, they could work for me.